JPMorgan reclaimed the crown from Goldman Sachs as the leading merger advisor during the first quarter of 2019. The bank increased its merger-deal volume by 33% to overtake rival Goldman, whose volume was up 3.3% year-over-year. JPMorgan was the top dealmaker in the US while Goldman headed the class in Europe. JPMorgan led global mergers for the first quarter of 2019 with $322 billion of announced transactions globally, according to data compiled by MergerMarket. The banking giant has regularly been among the top merger advisers in recent years. 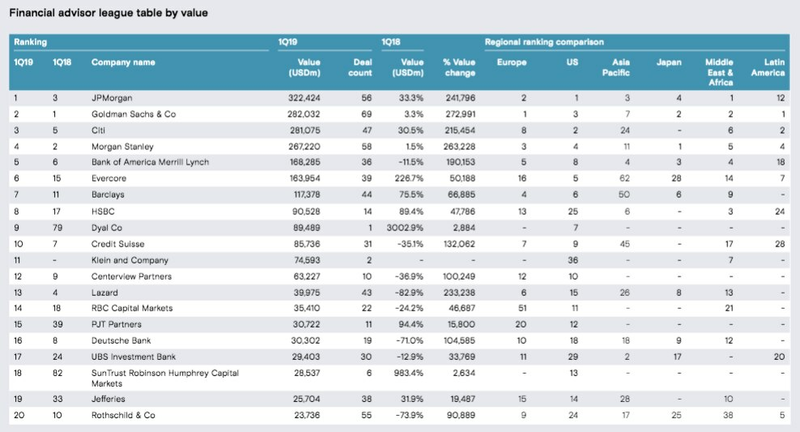 Over 3,500 mergers were announced globally worth a total of $802 billion in the first quarter, a 15% decrease from the prior year, according to MergerMarket. JPMorgan advised on over 40% of the deal volume over 56 transactions, while Goldman was second with a 35% share. JPMorgan’s surge to the top of the table occurred thanks to a 33% year-over-year jump in deal volume. The Jamie Dimon-led JPMorgan saw a big boost from its role as lead advisor to Celgene in its $74 billion sale to Bristol-Myers Squibb. Goldman was notably absent on the deal, a rare miss for the firm on a leading transaction. Morgan Stanley served as the lead adviser to Bristol-Myers Squibb. Overall, US deals comprised of more than half of the global deal volume for only the third quarter since 2007, MergerMarket said. Both JPMorgan and Goldman advised on the largest deal outside the US, whereby the world’s largest oil producer, Saudi Aramco, purchased the chemical firm Saudi Basic Industries for $69 billion. Citi, Morgan Stanley, and Bank of America Merrill Lynch rounded out the top-five slots, showcasing the dominance of bulge-bracket firms. Boutique adviser Evercore leapt from 15th to sixth place in the rankings while rival Lazard fell from fourth to 13th.